Tickets are still available. We do not limit tickets. Hudson Area Chamber of Commerce & Tourism Bureau - 502 2nd Street. CASH, CHECK or CREDIT CARD this location. Hudson House Grand Hotel - 1616 Crest View Drive. CASH OR CHECK ONLY this location. The annual Christmas Tour features 4 privately owned homes and the first floor of the historic Octagon House, all decorated in their Christmas finery. A 2-Story Hidden Treasure, snuggled in a quiet neighborhood featuring a large kitchen with granite countertops and custom backsplash and a great room with 20 foot ceilings that brings in natural light. This home features a bit of 'whimsy' in each room, with warm, bold colors that make the woodwork 'pop'. Mid-Century Modern Ranch, nestled on 5 acres, this 1997 home exudes its own personality with a very bohemian-eclectic and well-traveled style. The foyer greets you with a beautiful curved staircase that sets the tone as risky colors and uniquely decorated rooms treat you to something delightfully unpredictable. A Transitional Style Home, traditional and contemporary design, furniture and finishes that create a classic design that marries well with the homes architectural details. Located in the heart of downtown Hudson, this Victorian two-story home has upper and lower front porches, sweeping staircase and a Chef's kitchen. A 1920's Home, fully remodeled DIY style, featuring rustic charm with custom wood products including hickory hardwood floors and cabinets, reclaimed barn timbers, paneling and cabinets. The heritage of this homeowner is featured throughout the home. Ticket Prices: Tickets are $25. Tickets purchased by November 10, 2018 will be entered into the door prize drawings at stores and the Grand door prize drawing in each home. This popular, daytime tour features four private homes and the first floor of the historic Octagon House decorated OVER-THE-TOP for the holiday season. The Traditional Tour includes the convenience of a free shuttle service with stops to dine and shop along the way. A map is ovided with each ticket. Shuttle transportation is included or you may drive yourself. If you are interested in having a booth at the craft sale (Handmade items only, no manufactured items) download the Crafter Application. An additional room will be opened if enough applications are received. The main room is full. 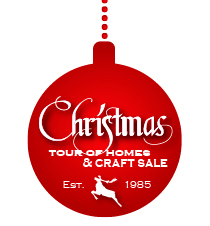 ​Slip away with the girls for the weekend to shop, dine, relax and attend the Christmas Tour of Homes! View the 2018 lodging discounts HERE. Interested in having your home on the Tour? Please email info@hudsonwi.org.